« In Cairns: Mandarin or Cantonese? It would be fair to say that most Australians assume that Cantonese is the language spoken in mainland China.This is not surprising because their exposure to things Chinese has been limited to, for example, Chinese restaurants which in the main employ Cantonese speaking staff and serve Cantonese style cuisine. However, in China, Mandarin is the official language. There are historical reasons for thinking that Cantonese is the lingua franka of China. Until recently, most Chinese in Australia were the descendants of miners and migrants who came from Southern China as far back as the late 1800s when Gold was discovered in North Queensland. What may be surprising however, is the fact that the Cantonese dialect is not spoken widely in mainland China. It is generally limited to the southern province of Guangdong, and the special zones such as Macau, and Hong Kong. Further, Cantonese cuisine is only one of four main schools in mainland China. These regional cuisines have different characters which are described by an old Chinese saying: the East is sour, the West is spicy, the North is salty, and the South is sweet. This regional variation is complicated by another factor. Folk who live north of the famous Yangtze River eat wheat, while folk who live south of this mighty river prefer rice. Point: this culinary diversity is a good metaphor for the wide cultural, geographical, and linguistic variation to be found across the length and breadth of mainland China. So what binds this ancient civilisation together? Apart from a strong central government which will not tolerate dissent, the most important unifying factor for a diverse mainland China is its official common language – Mandarin. 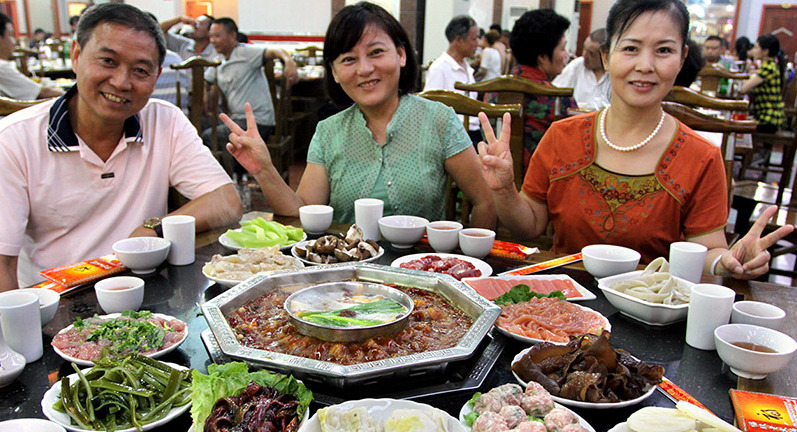 For example, if a Cantonese speaking businessman from Guangzhou travels to Chongqing to negotiate a deal, he will communicate in Mandarin over a local hot and spicy huoguo (hotpot) meal. If he goes to Beijing, he will converse in Mandarin as his host introduces him to the wheat-based Baozi and jiaozi (dumplings). And if he makes the long journey to Urumqi in Western China, he will still speak Mandarin as he eats the local Uyghur delicacies while doing business. Australians who hope to engage with China at a personal level, and who wish to enjoy the wide cultural diversity of this fascinating and mysterious society, should consider learning Mandarin. Mandarin – the lingua franca of China.